Clemson, SC (February 16, 2016)—The National Dropout Prevention Network (NDPN) recognized the nine graduates of its National Dropout Prevention Specialist (NDPS) certification program during its 2016 national conference in Myrtle Beach, South Carolina. 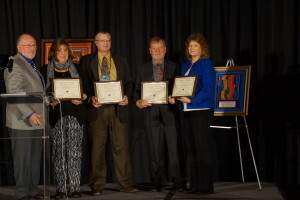 Four graduates were present at the conference to accept plaque certificates: Marina Leonidas, Truancy Court Specialist for Charlotte-Mecklinburg Schools in North Carolina; Dr. Patrick O’Connor, Associate Professor at Kent State (Ohio) School of Teaching, Learning and Curriculum Studies; LeAnn Stewart, Vice President of Curriculum and Instruction for AdvancePath Academics; and Dr. C. Wayne Lovell, Superintendent of Mountain Education Charter High School in Georgia. Five additional graduates are Dr. Emily Freeland, Regional Support Coordinator for the Alabama State Department of Education; Sonja Bens Harrison, Director, Administrative Services for McKinney ISD, Texas; Randal Ellison, Coordinator of Student Discipline and Educational Opportunities for Illinois School District U-46; Dr. Tamera L. Foley, Executive Director of Teaching and Learning, Clayton County Public Schools in GA; and Seith M. Bedard, Director, Simon Youth Foundation’s Peabody Learning Academy, Massachusetts. Implemented in 2014, the National Dropout Prevention Specialist (NDPS) certification program verifies participant knowledge and expertise in at-risk youth issues and strategies for increasing graduation rates. The certification program is open to all professionals who work with or on behalf of students, including educators, counselors, school administrators, at-risk youth workers, and board of education members. All NDPS certification program participants attend professional development workshops at the At-Risk Youth National FORUM and other conferences. Workshops required for the certification are based on the NDPC/N’s 15 Effective Strategies for Dropout Prevention framework, which is comprised of fifteen recommendations in the categories of School and Community Perspective; Early Interventions; Basic Core Strategies; and Making the Most of Instruction. Participants also submit to the NDPC/N Model Program Database or provide a field project report detailing an effective dropout prevention initiative they designed or in which they are involved. For additional information on the NDPS certification program or to enroll, visit the NDPC/N Web site at www.dropoutprevention.org and look for the National Dropout Prevention Specialist certification program link on the “Services and Certifications” dropdown menu. Established in 1986 with a mission to reduce dropout rates, the NDPC/N shares solutions for student success and dropout prevention through its clearinghouse function, active research and evaluation projects, publications, and a variety of professional development activities and conferences. The organization’s Web site—www.dropoutprevention.org—is the nation’s leading resource in providing effective, research-based solutions to engaging and supporting students to reduce dropout rates and increase high school graduation rates. The NDPC/N is housed in the Eugene T. Moore School of Education at Clemson University, Clemson, SC. Graduates of the National Dropout Prevention Specialists Certification Program receive their certificates from Dr. Sandy Addis at the 2016 At Risk Youth National FORUM in Myrtle Beach, SC. Pictured are (L to R) Dr. Sandy Addis, Director, National Dropout Prevention Center/Network; Marina Leonidas, Charlotte-Mecklinburg Schools; Dr. C. Wayne Lovell, Mountain Education Charter High School; Dr. Patrick O’Connor, Kent State University; and LeAnn Stewart, AdvancePath Academics.